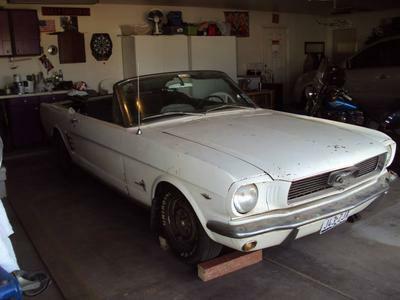 My Father-in-law found this 1966Mustang Convertible in a field in the Philippines and paid $200 for it back in 1980. So the local shop in the PI went to work getting it back on the road, so it could be brought back to the states. It was his daily around town driver. It now needs a lot of TLC. It’s been sitting for 7 yrs in the garage. He always had plans to restore it but never got around to it. Joe wants to work on it every day. Too bad I have to work to pay bills. We’re having a blast. Part of the deal is Joe's grandfather gives him the first ride in it. Hey Rich! That's a great story and a fantastic father and son project. My son's work on my 65 coupe when he was 13, led to his buying and restoring his own 68 Cougar (almost a Mustang) which makes him kind of unique among his friends who all have little import cars. Feel free to send some more pictures as you and your dad do the restoration via this section and I will make sure that they get up on the site.